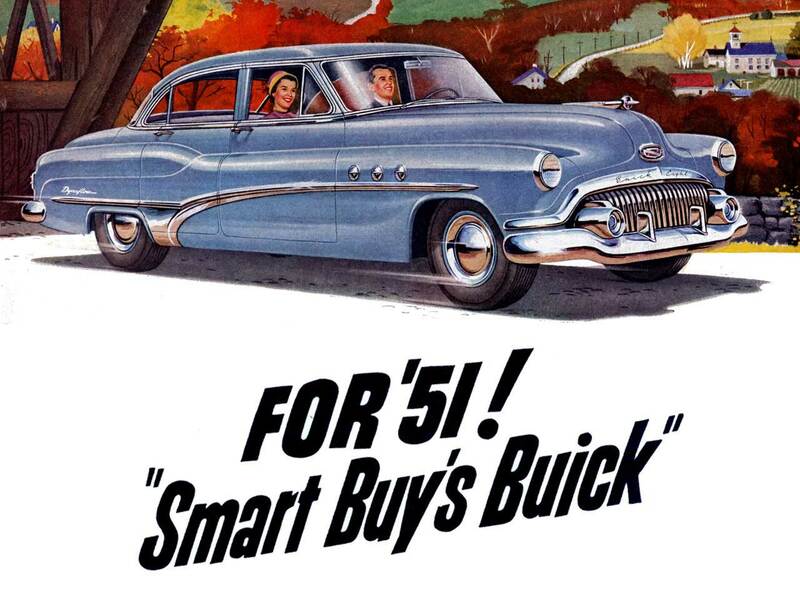 This section is about the all original 1951 Buick Specifications! It is based on original publications of the day and can be seen as authentic. Please notice that is must not reflect todays knowledge. But on the other hand – if you love originals and want to restore your 51 Buick back to factory fresh condition, this is the info you need. Learn more about the 1950 Buick engine, its firing order, the V8 arrangement, major engine parts and how they are tuned properly! Get more period correct facts for both transmission (Synchromesh transmission and Dynaflow transmission), brakes, steering and electrical units like the battery. Wheelbase - Models 52 and 72 - 125.5" 130.2"
Tread - Front 59.1" 59.1" 59.1"
Tread - Rear 59.0" 62.2" 62.2"
Overall Length with Bumpers 204.8" 206.2" 211.0"
Overall Length with Bumpers - Models 52 and 72 - 210.2" 215.0"
Overall Maxmium Width 76.7" 80.0" 80.0"
Height - At Normal Load 63.4" 62.8" 63.3"
Height - At Curb Weight 65.3" 64.8" 65.2"
Minimum Road Clearance ( Normal Load) 6.8" 6.8" 7.3"
Side Member - Front and Rear 5.58" 5.56" 5.56"
Side Member Stock .090" .102" .150"
Side Member Stock - Models 52 and 72 - .120" .164"
Maximum Flange Width 2" 2" 2.25"
Approx. Loaded Height - Front 9.25" 9.25" 9.25"
Approx. Loaded Height - Rear 9.562" 9.562" 9.562"
Oil Capacity 4 Lbs. 4 Lbs. 4 Lbs. Brake Drum Diameter 12" 12" 12"
Brake Lining - Width & Thickness 1.75" x .187" 1.75" x .187" 2.25" x .187"
Total Brake Area Sq. Inches 161.5" 161.5" 132.75"
Bore and Stroke 3 3/16" x 4 1/8" 3 3/16" x 4 1/8" 3 7/16" x 4 5/16"
Width of Chain .812" .812" .812"
Pitch of Chain .500" .500" .500"
Connecting Rod Bearing - Diameter and Length 2.125" x 1.030" 2.125" x 1.030" 2.25" x 1.306"
Head Diameter 1.531" 1.531" 1.781"
Overall Length 5.109" 5.109" 5.25"
Valve Lift .348" .348" .348"
Minimum Intake Part Diameter 1.125" 1.125" 1.375"
Head Diameter 1.344" 1.344" 1.437"
Minimum Exhaust Part Diameter 1.031" 1.031" 1.062"
Oil Filter Make A.C. A.C. A.C.
Capacity of Oil reservoir - Refill* 5.5 Qts. 5.5 Qts. 5.5 Qts. Core Thickness 2" 2" 3"
Less Heater 13.5 Qts. 13.5 Qts. 18 Qts. With Heater 15 Qts. 15 Qts. 19.5 Qts. Diameter of Fan 18" 18" 18"
Fuel Pump - Make A.C. A.C. A.C.
Air Cleaner - Make A.C. A.C. A.C.
Intake Manifold Diameter 1.187" 1.187" 1.375"
Tail Pipe - O.D. 2" 2" 2"
Total Oil Capacity 9.5 Qts. 9.5 Qts. 11 Qts. Converter Capacity 6 Qts. 6 Qts. 7.5 Qts. Transmission Capacity 3.5 Qts. 3.5 Qts. 3.5 Qts. Steering Gear Lubricant Capacity 13 Oz. 13 Oz. 17 Oz. Steering Wheel Diameter 18" 18" 18"
Caster - Degrees .25 to 1.5 Pos. .25 to 1.5 Pos. .25 to 1.5 Pos. Camber - Degrees .875 Pos. To .625 Neg. .875 Pos. To .625 Neg. .875 Pos. To .625 Neg. Rim Diameter and Width 15" x 6" 15" x 6 1/2" 15" x 6 1/2"
Tire Size 7.60-15" 7.60-15" 7.60-15"
Capacity - at 20 Hour Rate 100 Ampere Hrs. 100 Ampere Hrs. 120 Ampere Hrs. Car Speed for Maximum Charging Rate 25 MPH approx. 25 MPH approx. 25 MPH approx.